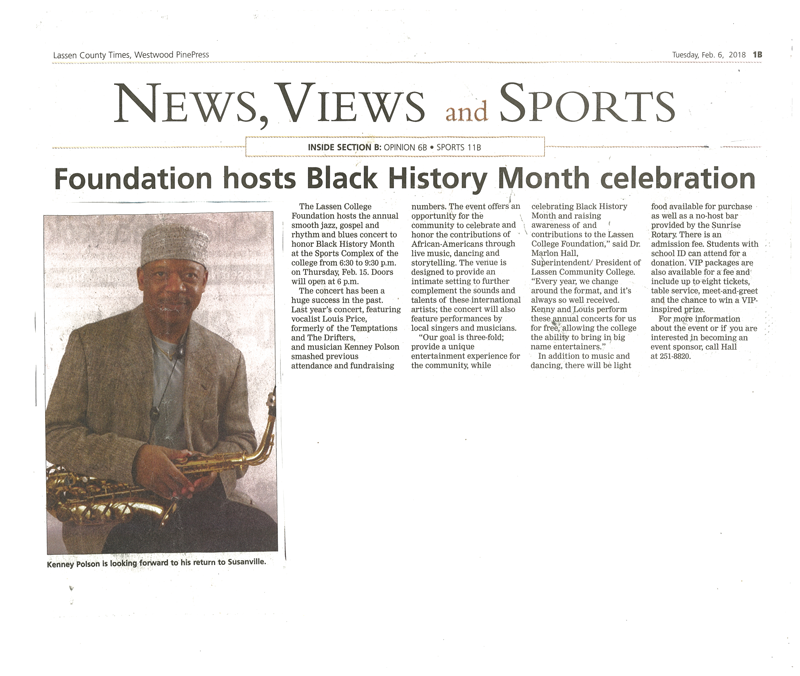 The Lassen College Foundation hosts the annual smooth jazz, gospel and rhythm, and blues concert to honor Black History Month at the Sports Complex of the college from 6:30 to 9:30 p.m. on Thursday, Feb 15. Doors will open at 6 p.m. The concert has been a huge success in the past. Last year’s concert, featuring vocalist Louis Price, formerly of the Temptations and The Drifters, and musician Kenney Polson smashed previous attendance and fundraising numbers. The event offers an opportunity for the community to celebrate and honor the contributions of African-Americans through live music, dancing, and storytelling. The venue is designed to provide an intimate setting to further complement the sounds and talents of these international artists; the concert will also feature performances by local singers and musicians. In addition to music and dancing, there will be light food available for purchase as well as a no-host bar provided by the Sunrise Rotary. There is an admission fee. Students with school ID can attend for a donation, VIP packages are also available for a fee and include up to eight tickets, table service, meet and greet and the chance to win a VIP inspired prize. Copyright © 2018 Kenney Polson. All rights reserved.